We daresay that this hotel in China’s Yunnan province won’t be winning any prizes any time soon for grammatically precise branding. However, there’s no gainsaying its thoughtful intentions and the purpose of its designers, Co-Direction Interior Design who have transformed a former private residence into a charming 19-room property. The location of the hotel – in the middle of Dali’s old city – informs much of its aesthetics. In particular, the layered courtyards and the extensive use of bamboo, grey bricks, peaked roofs and exposed raftered ceilings are a gentle ode to traditional residential architecture. 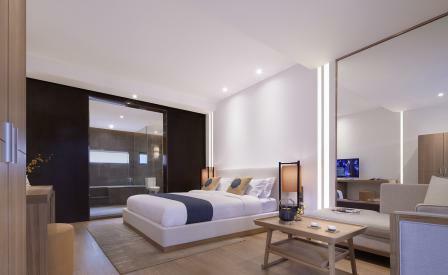 Gentle, because Co-Direction hews off the classic references in the bedrooms with rigorously modern and customized furnishings. The amenities are fairly limited – there is no spa and the bijou restaurant serves only breakfast – though the hotel is particularly enthusiastic about the reflective pond on the ground floor whose mirror-flat surface brings in the sky through the elongated sky-well. Meanwhile, an outdoor deck offers lovely views of distant Cangshan mountains.